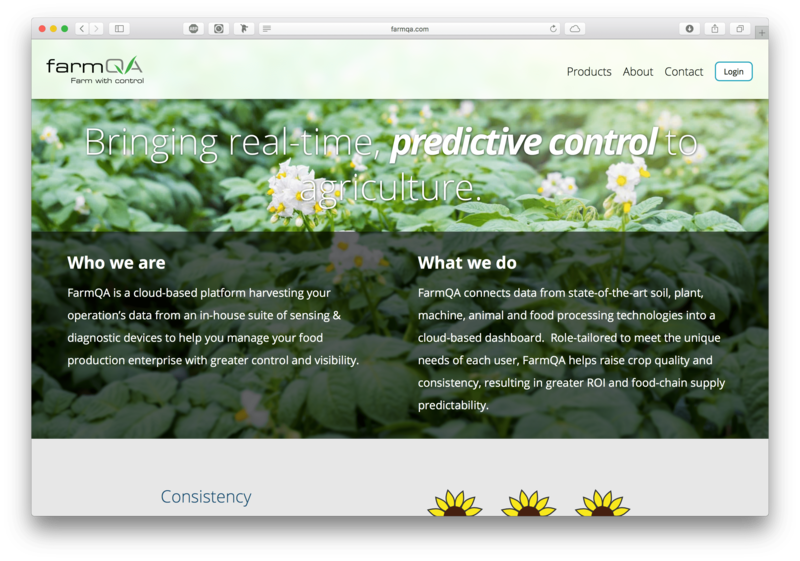 As the user experience designer working at FarmQA, I define FarmQA's vision of providing IoT and machine learning analytics to growers across the world. My job responsibilities range from defining the vision for our software products, researching our users, defining the design language, SEO and marketing, and meeting our customers' needs. Responsible for all aspects of the user experience of FarmQA's suite of products. As part of the engineering team, I designed and helped implement our first mobile product, FarmQA Scouting. I have directed the effort to redesign the FarmQA logo, and I have defined a visual language for FarmQA products based on the Material design language. Completed 2 stages of the redesign of FarmQA Controller. The first phase involved reworking the base navigation. The 2nd was redesigning the map interface. Goals of both efforts were to make an elegant, usable, consistent, and appealing experience for our users. Designed and developed FarmQA.com with current SEO practices. Directed the completion of a new logo and brand system for FarmQA. Designed our first mobile application, FarmQA Scouting. Designed trade show marketing materials. 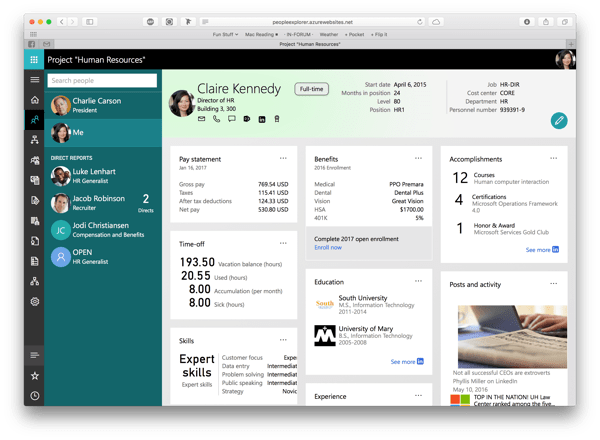 Responsible for the design and user experience architecture of a wide range of experiences within Microsoft Dynamics including applications for Finance and HR departments. In this role, I translated user requirements, business problems, and scenarios into efficient interfaces using storyboards, wireframes, prototypes, and usability testing. As part of a collaborative team, defined the user interface implementation strategy and architecture for the web-based presentation framework, specifically defining how HTML and CSS were used. Responsible for ensuring the accessibility of our product designs. Additional responsibilities include abstracting the core interaction patterns from a set of over 3000 pages with the end goal of creating a framework for consistency in the user interface. As user experience architect, defined the strategy of the HTML5 Dynamics AX for desktop and mobile. Defined the HTML5 and CSS3 coding guidelines for the presentation framework and implemented the LESS CSS compiler. Led the implementation of the CSS3 framework for the presentation framework and mentored other designers in CSS3. 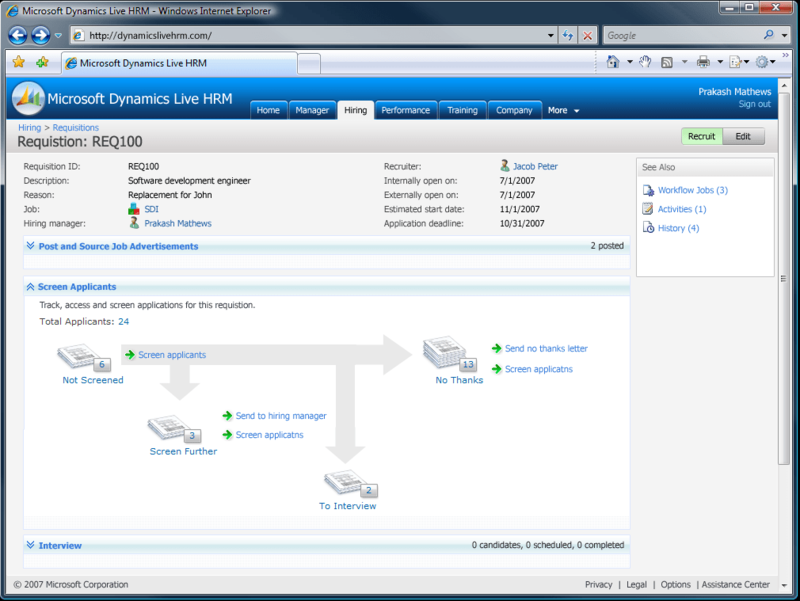 Designed the Dynamics AX 2012 user experience in collaboration with other designers. Wrote guidelines for program managers and third party ISVs. 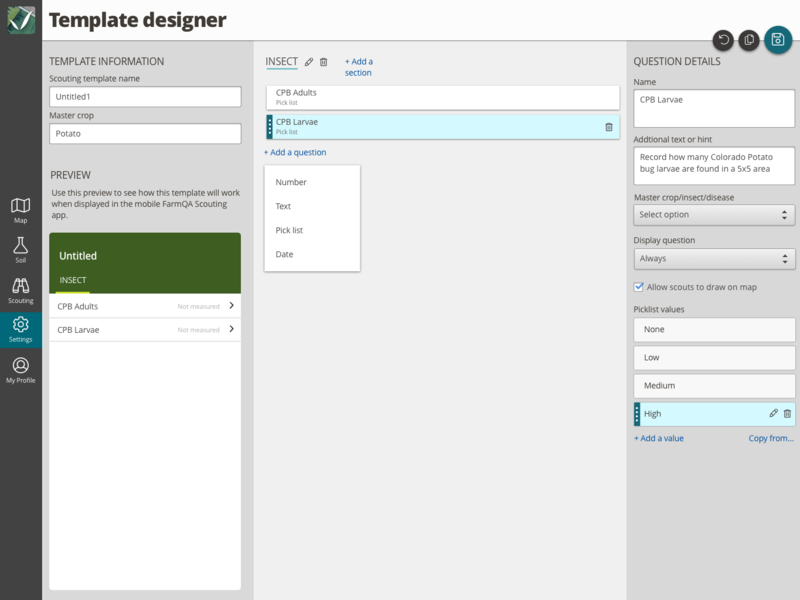 Designed the user experiences for an HTML based HRM module. 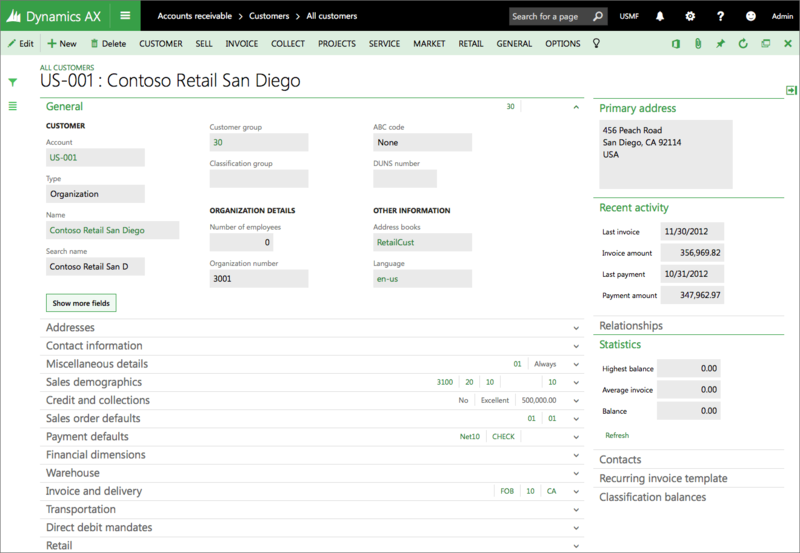 Defined and designed a new information architecture for Microsoft Dynamics. Designed and received a patent application for a dynamic user interaction model based on the configuration of an adaptive business process. One of the first accomplishments when I started at FarmQA was to create the FarmQA visual language. The designs for the new FarmQA Controller are just being implemented with much of the work centered around making a more elegant mapping interface. This interface is a bulk crop assignment tool. 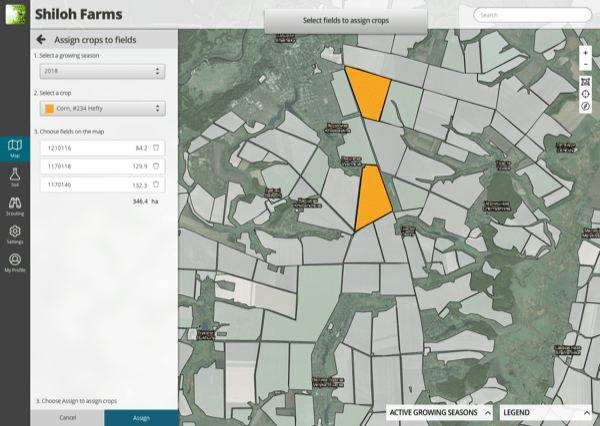 The tool allows the user to quickly assign crops to fields using the map and provides a summary of the number of acres for that crop. This interface is a designer for customizable scouting templates. The goal is to provide a rich and interactive editing environment with a live updating preview pane that enables customers to quickly build a template for their operation. 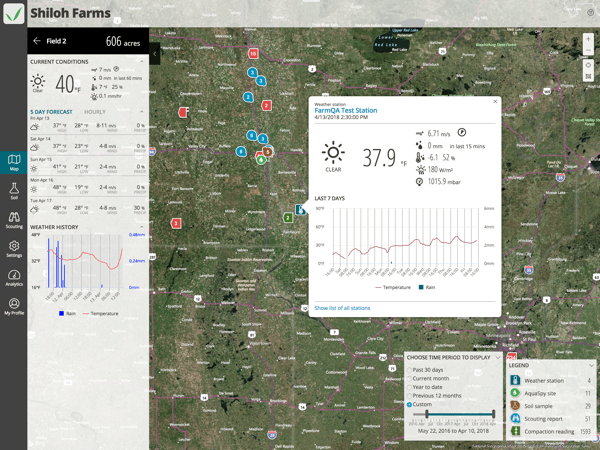 FarmQA Controller provides the user with a portal to the farm data. Controller provides multiple map layers as well as a task based system for managing the data collected about each of the fields. This interface is map based and layers multiple types of information together, allowing the users to make informed decisions about their operation. The scout can see the locations in a field that have been scouted and those areas they may need to visit. The FarmQA Scouting app is flexible and can handle any type of crop or field. It is designed to optimize data entry using the customizable templates so that an organization can only ask the pertinent questions of the scouts while in the field. For each question, the scout can draw additional details on the map and take pictures of any problems. FarmQA Scouting is a cross platform mobile application for iOS and Android. The app targets farm hands who scout fields during the growing season. FarmQA Scouting supports a configurable question editor that allows a farm administrator to create custom scouting templates for each crop. A priority after starting at FarmQA was to reimagine the FarmQA web site. Given our status as a startup, the primary goal of the site was to inform prospective customers and investors about the FarmQA vision in the realm of agricultural technology. Example of a new card oriented page designed for this product. 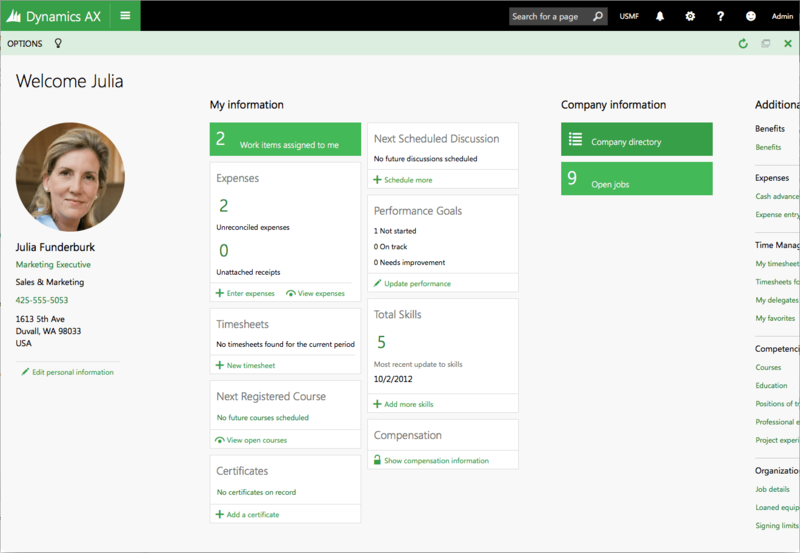 This design provided a snapshot of an employee in one view. The primary navigation was that of an organizational chart. The org charge control was very dynamic and fun to use. 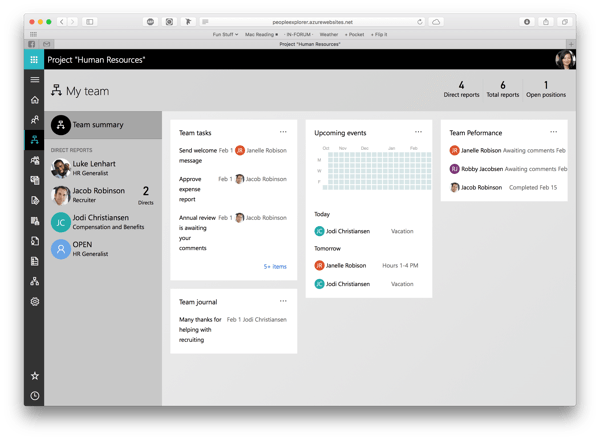 This page allowed the manager to see a snapshot of their team and provided the ability to see details of any employee. 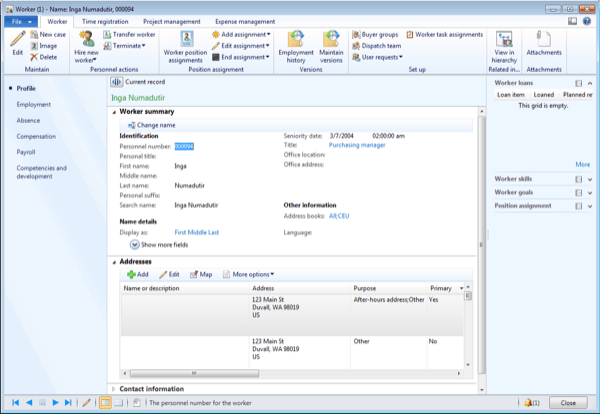 The Benefit management workspace is targeted at a benefit manager. It was designed as a one stop shop for everything related to benefits. 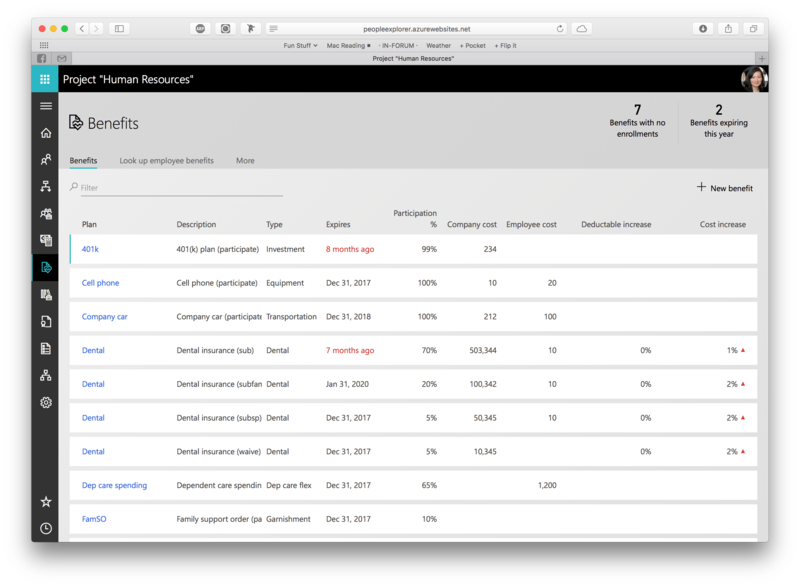 In contrast, the previous AX version of Benefits was composed of 100's of forms and a large menu to navigate. Simple - Since this was migrated from AX, it was inheriting a fair bit of complexity. Delightful - We wanted to improve upon the flow and function of the AX animations and took it to another level. 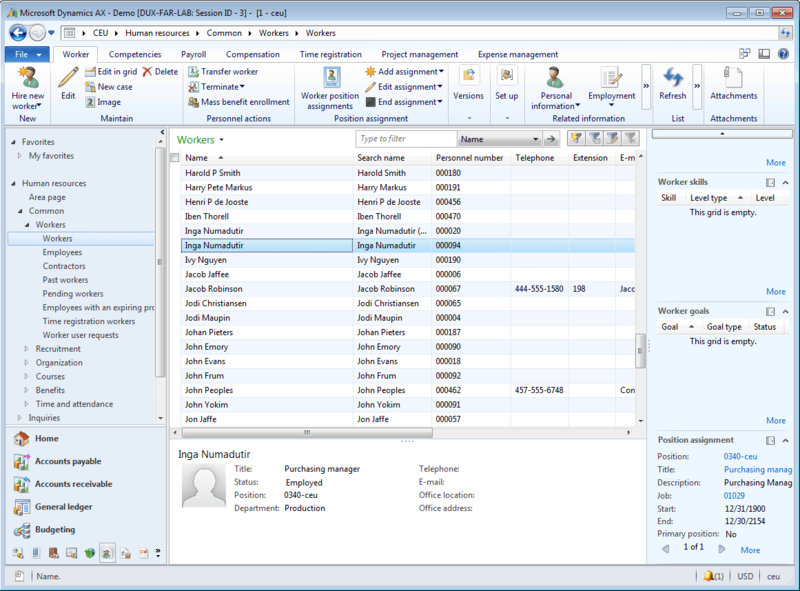 Functional - Above all we still had to do all of the tasks that human resource managers need from an HR solution. Also designed the innovative "people centric" navigation paradigm that focused the main navigation around people. The key element of this design is the people navigator, which presents the organization chart of a company as the primary way to navigate. An example of the many forms that we migrated from AX 2012 to HTML. 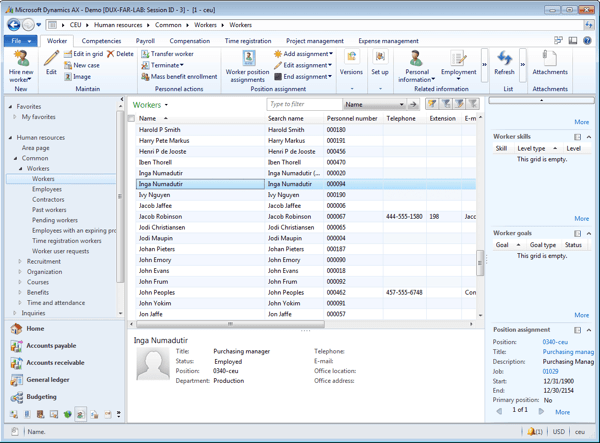 An example of a new concept called Workspaces, introduced in this release. This page pattern collects and displays to the user many different aspects of their work from 100's of pieces of data stored in the HRM database. This release of AX also featured an enhanced filtering design. This design is based on a familiar left-side navigation and presents the filters criteria in very understandable terms to the user. In the future, we hope to enhance this to be a full faceted filtering experience. This project reimagined Microsoft Dynamics AX from a Windows based application to a single page app. 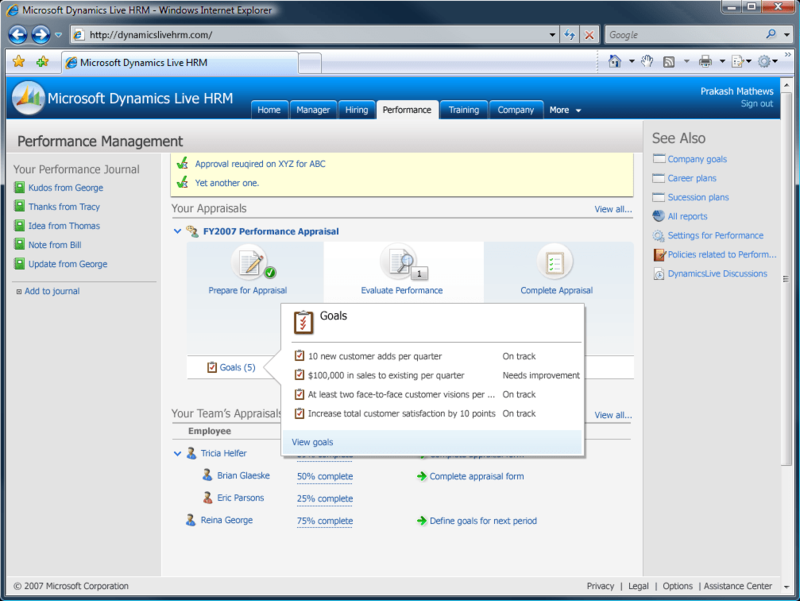 Task analysis and task type development based on the Dynamics Customer Model. 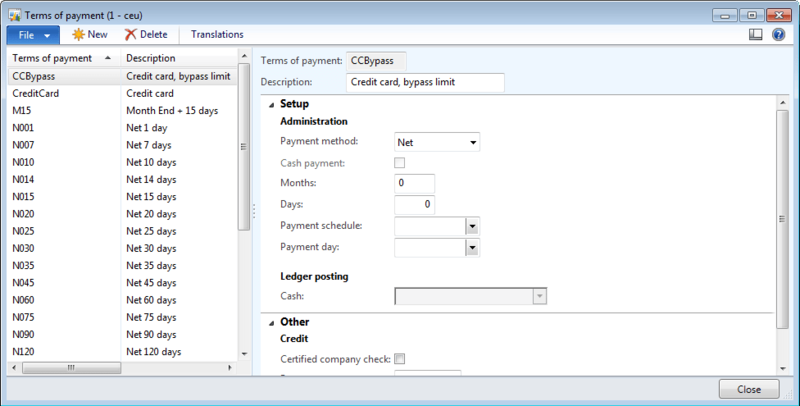 The task type analysis led to the development of basic interaction patterns for an ERP system. User interface component design and specification. User interface guidelines and upgrade strategies from the legacy product. Led a team of front-end developers working on the CSS and HTML for the client of Dynamics AX. Assisted in implementation of a visual test strategy and defined the architecture of CSS standards for the organization. Defined the CSS architecture for a multi-device, multiple theme and responsive web application. Control development within the custom Angular- like binding services developed for Dynamics AX. An example of a form that embodies the entity detail pattern. Due to the complex nature of the data stored required by the users, a complete information architecture had to be designed for forms like this. In this case, multiple iterations of the form were produced and tested with users. We also used card sorts to assist with refining the design of the information. 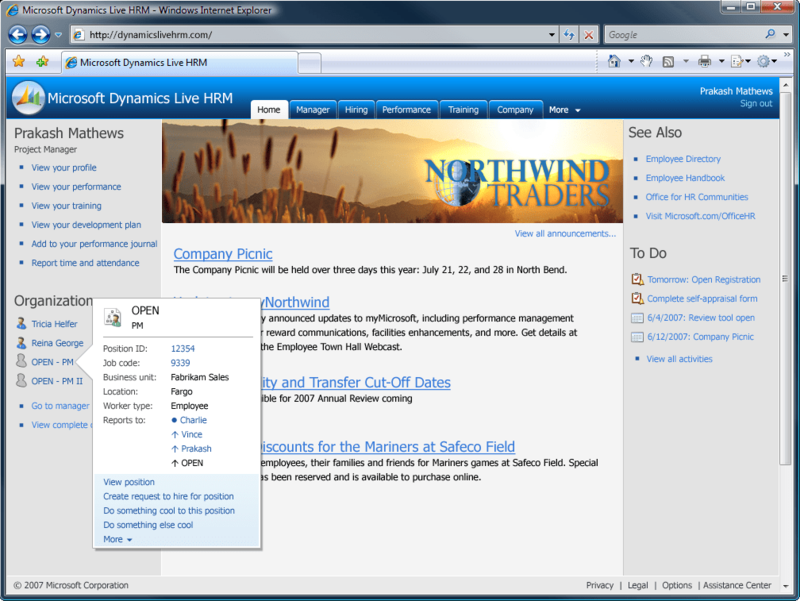 For list pages in the system, we added elements called Factboxes to the right side of the window. Factboxes allowed the user to see additional information about the selection, without having to drill down on the full entity. Our goal with the list pages was to provide the ultimate interface in the system where a user could find the data they need to work with and work against that data. Another key form that we introduced was what we call a Simple List & Details. This form pattern replaced a form pattern that we found to be unusable by a majority of new users. We used automated tools and manual verification to convert over 200 forms to this pattern. 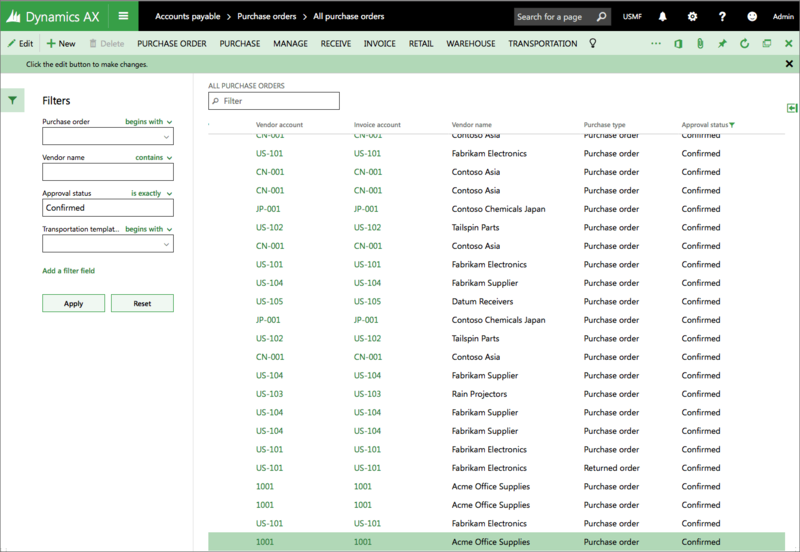 For the Dynamics AX 2012 release I led the team designing the core user experiences. This team researched the common problems and pain points across the system and determined how best to solve these issues for maximum benefit. The team redefined the patterns used by over 1000 forms. The landing page for this product was envisioned to serve the needs of the employee and a manager. It was also to be used by the human resources department to publish news and information to the employees about important upcoming events. The navigation of this product used a tabbed navigation system that was envisioned to be simple and understandable to a majority of the users. The performance management landing page for an employee shows the employee the current status of the performance management process. Additionally, if the employee is also a manager, the page shows information related to the status of the manager's direct reports. Throughout the product, progressive disclosure mechanisms, or super tooltips, were utilized to make information in the system easy to access. This page shows an activity center for a recruiter. This page shows for a given position to be hired the status of all of the applicants for the position. Clicking on one of the stacks would open a list of applicants and provide a set of actions that could be taken against each one including viewing their resume and application. This was to be a new HRM application integrating to Microsoft Dynamics to provide web-based access to human resource data to employees. As the lead designer, I delivered designs, guidelines and research. One of the primary innovations of this project was an interaction pattern library. Each activity shown in an activity center is divided into stages and tasks. 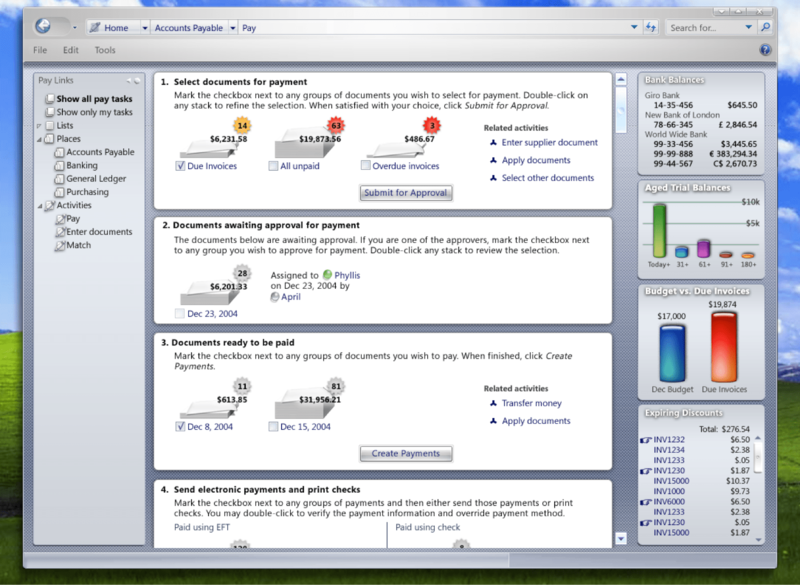 The stages were typically numbered and the tasks within each stage displayed as links or buttons. This activity center shows a continuous process that provides a financial supervisor with insight into the progress of the process. It also provides workers with insight into what they need to do next. This activity center illustrates how a checklist process would be visualized. In comparison to the previous illustration, the stages and tasks of this activity center are much more discrete and have a set start and due date. The design for activity centers was derived from an extended research and analysis project around the ERP customer model. 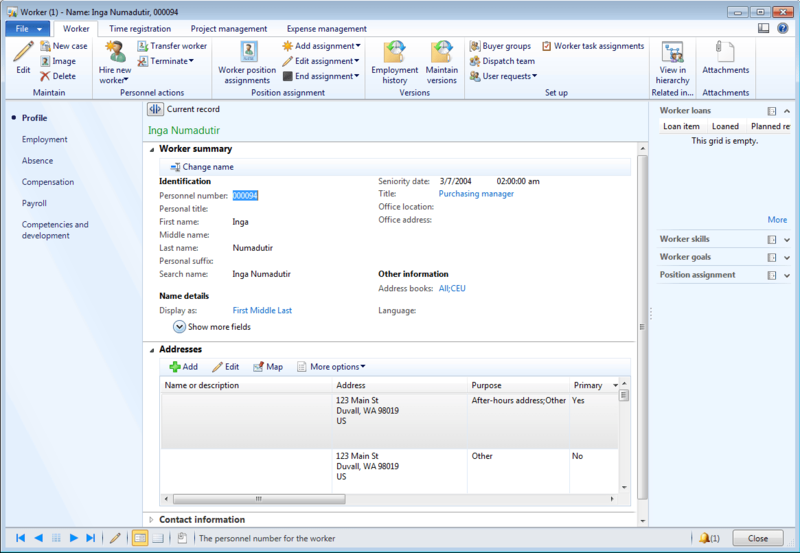 The activity center is a set of elements helping a user understand the status of work in a long running business process. It does this by showing the user what they need to do to complete their work within that process and what other people are working on. The set of elements shown in an activity center is determined by the customized business process. As shown below, activity centers can take many shapes as appropriate to the business process. 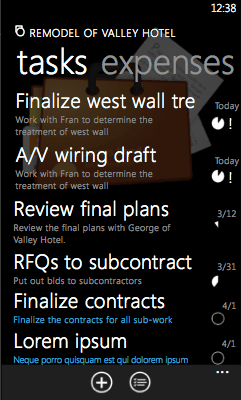 For each project, a view of the tasks for that project are displayed. The information about each task includes title, description, due date, completion, and priority. 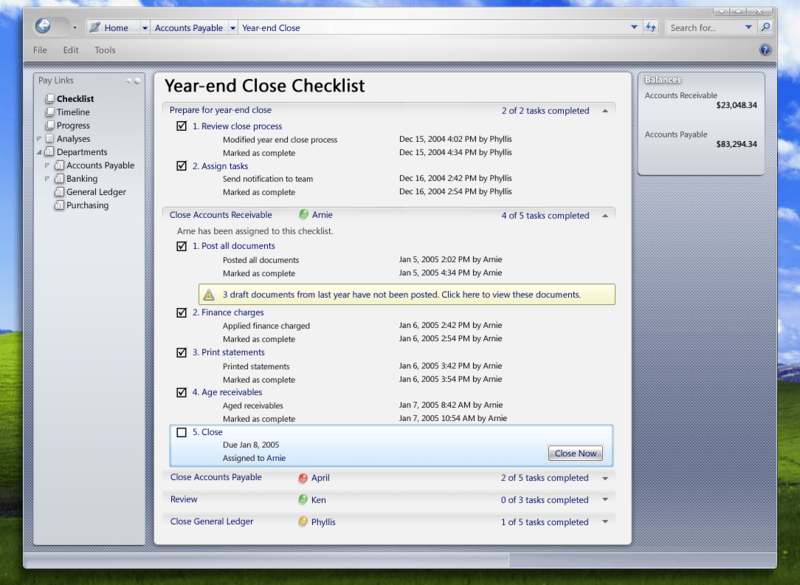 Additional views provided the ability to display the tasks in a timeline or by due date. An important performance indicator for a project team member is to ensure that their utilization numbers are high. 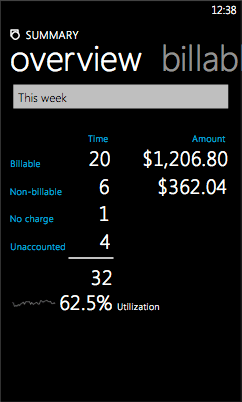 One view displays the utilization for the team member in a natural manner including the use of a spark line to show the utilization trend over time. Important to the project is that each project team members needs an efficient method of entering their time. Typically, this is a pain point with the users. This form was made as simple and efficient as possible. It was also envisioned that the time against a task could be entered using voice. 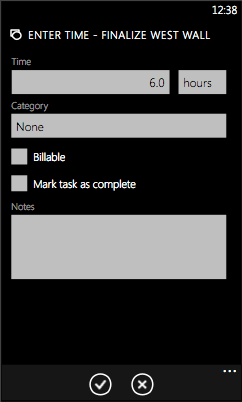 This is an exploration of a product to allow people to log project time and expenses in a service industry on the Windows Phone platform. The core scenario for this mobile application is that of monitoring tasks and deliverables.